At Liftopia, we love a good deal. If you’re on the hunt for new gear, outerwear, and (yes!) even lift tickets, check out these Black Friday/Cyber Monday deals for skiers and snowboarders. Window rates on lift ticket prices can be scary, but if you do enough planning in advance, you can score some great deals on Liftopia every day. This Black Friday/Cyber Monday weekend, tack on additional savings when you purchase a Liftopia gift card. Starting on November 21, when you spend $100, you’ll get $115; when you spend $150, you’ll get $175; and when you spend $200, you’ll get $250. See Liftopia Black Friday / Cyber Monday deal. On Skis.com, shop hundreds of ski and snowboard brands. For their Black Friday Sale, you can save up to 60% off plus an extra 10-20% off; free shipping; and doorbuster deals on over 60 items. See Skis.com Black Friday/Cyber Monday deal. Evo is another online retailer of outdoor gear that we love. Save up to 60% sitewide on Black Friday with price drops added throughout the sale. See Evo Black Friday/Cyber Monday deal. If you’re a skier or snowboarder in the Northeast US, you’re in luck. On Liftopia, we’ve got a few special deals only available on Black Friday/Cyber Monday weekend. Here are a few in the mix. Hunter Mountain: 4 Pack Lift Tickets for $219. Available at 9pm PST on Sunday, November 26. Jack Frost Big Boulder: 1 Day Anytime Lift Ticket for $30. Available at 9pm PST on Sunday, November 26. Mount Snow, Attitash/WC Mountain, Crotched Mountain: Peak Passport for $149. Available at 9pm PST on Sunday, November 26. Burke Mountain: 3 Pack Lift Tickets for $179. Available at 6am EST on Friday, November 24. 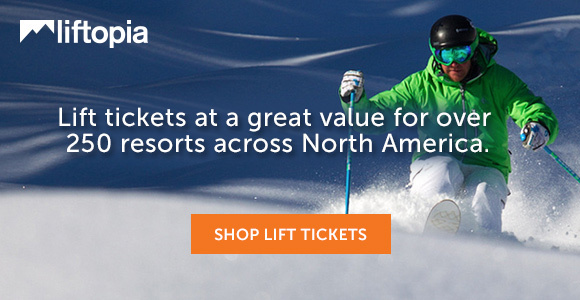 Search Liftopia for more lift ticket deals. Why wait until Black Friday? The House already has pre-season deals up to 70% off on skiing and snowboarding gear and apparel. On November 24th, expect to find even more discounts. See The House Black Friday/Cyber Monday deal.